The General Manager of a business unit of a major photonics OEM company with sites all around the world asked Dr. Vacca to put together a series of seminars on flow cytometry and biophotonics, and to deliver them to two of the company’s sites in Europe. Attendees to the seminars included engineers, R&D managers, salespeople, marketers, and executives. The seminar series starts with “Flow Cytometry 101“, the basics of the technology, followed by a high-level analysis of the interrelationship of technology trends and market drivers. Subsequent sections either delved deeper into technology topics or explored different aspects of the market. The majority of the sections are standalone modules that can be delivered on a “menu” basis. The attendees found particularly engaging the interactive exercises sprinkled throughout the seminar series. By drawing the audience into the delivery, these exercises stimulate creative thinking and facilitate learning of the materials. 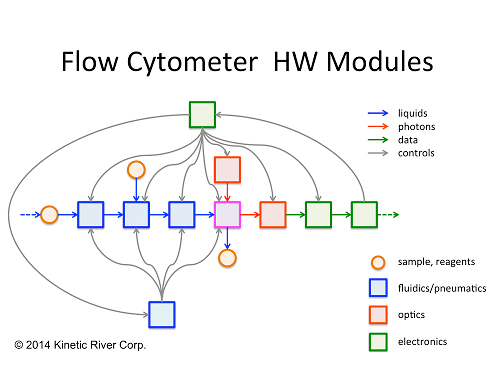 An example is this diagram, a schematic representation of the system architecture of a flow cytometer that the attendees were asked to help fill in to get a deeper understanding of module interactions. The seminars included technical as well as market-oriented content. The latest innovations and up-and-coming startups were reviewed in the broader context of existing technologies and established players.  Other, related technologies with disruptive potential were also reviewed.